Salone del Mobile, one of the world’s largest interior design and furniture fairs, returns to Milan this month to showcase the latest work from the best designers and creators around the globe. Over 2,000 brands will display their wares across five exhibitions - focusing on lighting, design and technology, young designers, furniture, architecture and interiors – with nearly 300,000 guests expected to attend. To help you navigate this year’s show we’ve picked out the unmissable pieces from the top brands at Salone del Mobile 2017. 2017 marks an important year for Armani/Casa because, along with a beautiful range of new pieces at Salone del Mobile, the brand will also be celebrating the opening of a huge new flagship store on Corso Venezia in Milan. 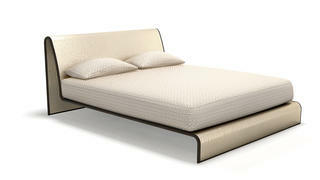 One of the key pieces on display at both the fair and in the new store will be the Morfeo bed (pictured above). Inspired by the idea of a floating bed, the Morfeo sports softly curved head and footboards with the entire structure crafted as a single continuous element and clad in an embellished technical fabric. For Salone del Mobile 2017, Milanese brand Dedar is presenting a range of works exploring the way art intersects with interiors and furniture. 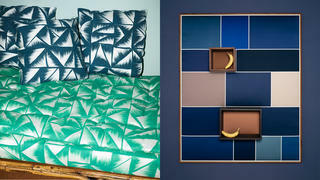 Along with a variety of new highly pigmented, embroidered, hand painted and foil printed fabrics (pictured left), Dedar has also teamed up with artist Brigitte Niedermair and designer Martino Gamper on a conceptual photography project named Screenshot. The project examines the way the colour blue has been used in figurative art over the past 500 years; the key hues have been rendered in Dedar’s fine fabrics and framed in teak and brass to create beautiful wall panels which are customisable, therefore offering clients endless possibilities and configurations. Stefano Ricci will be unveiling a new range of furniture at Salone del Mobile 2017 but for yachties the real highlights lie in the brand’s latest decorative pieces aimed at bringing a little glamour and opulence to your main saloon. 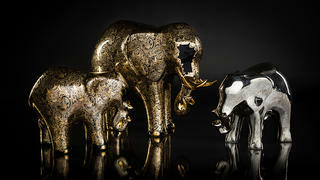 Rendered in shiny black and metallic porcelain, as well as variations decorated with pure platinum, Stefano Ricci will be launching a range of elephant and angel fish ornaments alongside a candle holder in its popular Royal Malachite range and a 14 karat gold-plated caviar server. 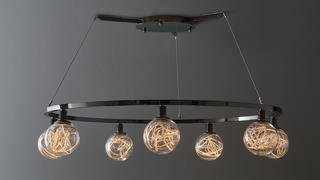 All interiors accessories are also available for purchase through the brand’s recently relaunched online store. Promemoria will be putting a focus on lighting at Salone del Mobile 2017 with a new range named Higgs designed by Piero Castiglioni. Offering a hanging lamp and two floor lamps, this minimal range is created in glossy black chrome-plated metal and finished with spheres of Murano glass filled with swirls of LED lighting. The effect combines the modernism of industrial style furniture with a soft, gentle light source ideal for any interior space. Making its Salone del Mobile debut in the xLux Pavilion in 2017 is Italian fine fabrics specialist Rubelli. Alongside the textiles for which it is known, the brand will also be exhibiting new furniture ranges designed both in-house with emerging designers Navi+Navi and by architect Luca Scacchetti. 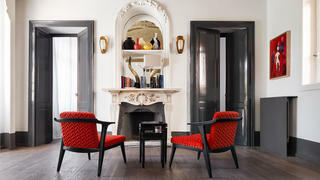 Key pieces include the modern and minimalist Domino sofa, the mid-century style Palazzo sofa and the elegant Piron chair (pictured) – all of which are almost endlessly customisable with any of Rubelli’s fabrics.